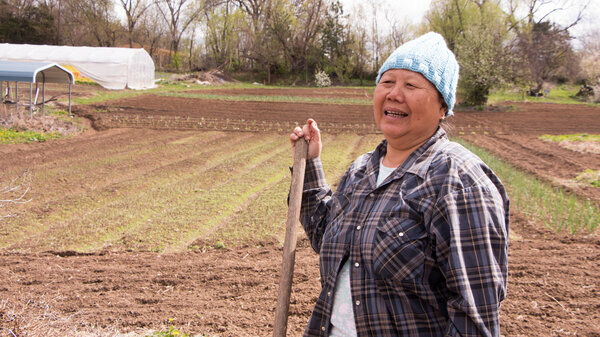 One place that refugees are making a life for themselves is in Kansas City, Kansas, where some are bridging their current and former lives through farming. Oluwakemi Aladesuyi reports at National Public Radio, “In the midst of boxy yellow and brown public housing, beyond the highway and past empty grain elevators, sits Juniper Farm. It’s spread over nine acres on the Kansas side of Kansas City. “As their children play on the grassy knoll behind us, four women sit at a plastic picnic table speaking in Karen, a language spoken in parts of Myanmar [Burma]. “They’re students at a program called New Roots for Refugees. The program aims to teach the basics and business of farming [in America] to refugees over the course of four years. At the end, many of the graduates are ready to start farms of their own. “August used to come here to help her mother. But now Beh paw has her own 3-acre farm which she runs with her sister. Last year the operation made more than $10,000. The potential to make money is important; many refugee families live below the poverty level.” More here. Read the story if you have time. One striking aspect: farm manager and adviser Sam Davis, an African American, experienced real intolerance when moving to Kansas from Arkansas, but to one of the Karen women, who had seen extreme isolation of different ethnic groups in Myanmar, America seems prejudice-free. You might also be interested in this article on Karen people who were relocated to Waterbury, Connecticut. Written by John Giammatteo, it appeared in Communities & Banking magazine in 2012. Beh paw Gaw is a New Roots graduate and a Karen refugee from Myanmar. Now she has her own three acre farm which she runs with her sister. This is fascinating. Juniper Farm sounds wonderful and I wish them all the best. Planting hope. Even though the phrase has gotten a bit hackneyed, I do believe “a thousand points of light” are the answer to many of the world’s troubles.